Are you ready for Skype for Business? If you have Microsoft Lync 2010 or 2013 on premises, or Lync Online with Office 365, you'll have access to the new Skype for Business client on "Patch Tuesday" - April 14, with Skype for Business Server set for release on May 1. The excitement we have seen among our customers over Skype for Business underlines the point the author makes in this article: more people than ever will adopt unified communications and collaboration this year, because it will help their productivity and their bottom line. That's why we call Skype for Business the UC Revolution. How is the AudioCodes OneBox Beneficial to Your Company? Over the last couple of years, organizations of all sizes have moved much of their operations to the Cloud, as it's become both more secure, and more cost effective. We think the introduction of the AudioCodes OneBox 365 is going to accelerate that trend among the SMB market. This "one box" allows a company to fully replace their existing PBX system and easily move into the future of collaboration and communication - at a very attractive price. Although Office 365 is quite robust and advanced in its own right, the OneBox takes it a step further and allows the full voice capabilities of Skype for Business. The big news at the Microsoft Convergence conference yesterday was the announcement that technical previews of the Skype for Business client are now online, and that roll-out of the upgrade will occur in April. Several weeks ago, we highlighted a Hewlett Packard case study of our client, Carmichael International, which details how we saved their Southern California company tens of thousands of dollars: by upgrading their old network utilizing Cisco routers, to a modern network including Microsoft Lync and HP Networking components. 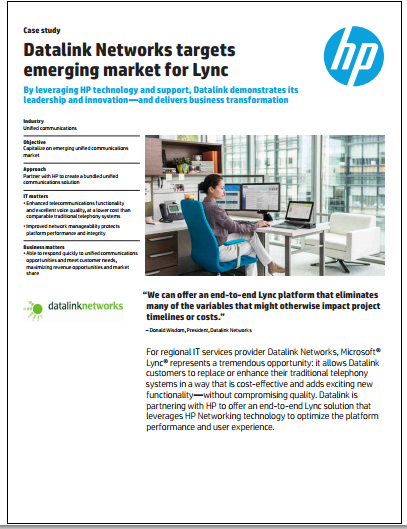 And now, we’re proud to announce that HP has published another case study focused on Datalink Networks – only this time, the subject is US… and how our company has led the charge in introducing Microsoft Lync to our customers throughout Southern California.